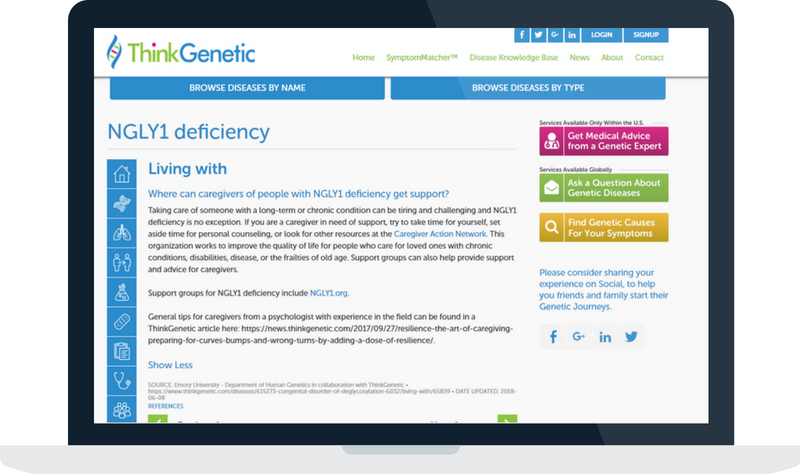 Co-founded by a patient advocate and a genetic counselor, ThinkGenetic helps individuals harness their personal power of advocacy by offering trustworthy information to guide them to the help they need, faster. Our team strives to create, update, and review content regularly to ensure the information we provide is accurate, referenced, and available 24/7 to anyone searching for answers about their genetic condition. You can search our knowledge base by Browsing Alphabetically or Browse by Type. NGLY1 deficiency, also known as Congenital disorder of deglycosylation or Deficiency of N-glycanase 1, is an extremely rare disorder characterized by a variety of different symptoms that can affect multiple organ systems of the body. Three characteristic findings of this disorder are varying degrees of intellectual disability, movement disorders, and a condition called alacrima. Movement disorders are any disorder in which there are problems with the speed, quality, or ease of making voluntary movements. Alacrima is a condition in which infants or children cannot produce tears when they cry, or they can produce tears but only infrequently. This can cause other issues with the eyes. Every person with this disorder does not necessarily have the same symptoms or features. There can be people who are mildly affected and others who have more severe health problems. NGLY1 deficiency is an autosomal recessive disorder meaning that for a person to have the disorder, they have to inherit two changed copies, or two variants, of a specific gene called NGLY1. There are only about 60 people known to have this disorder, so researchers and physicians are still learning about NGLY1 deficiency. If you wish to see content about a genetic disease or condition added or modified, please contact us.